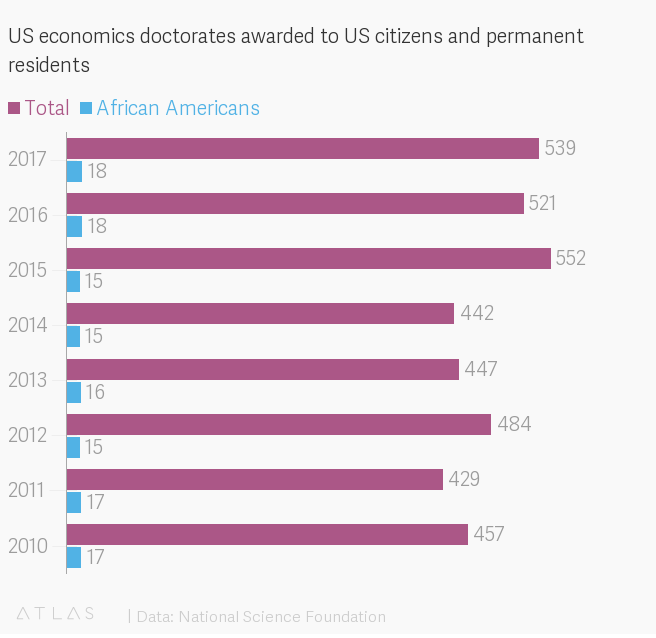 This post is motivated by Eshe Nelson's column "The Dismal Cost of Economics' Lack of Racial Diversity." 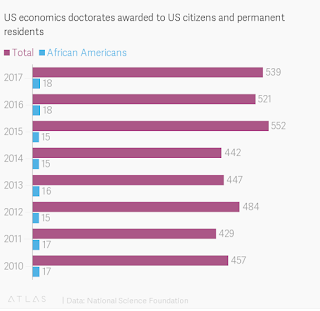 I was especially struck by this data -- out of the 539 economics doctorates awarded to U.S. citizens and permanent residents (by U.S. institutions), only 18 of the recipients were African-American. I thought it would be of some interest to see what the data looks like more broadly over other groups and over a longer period of time. I thank my research assistant, Andrew Spewak, for gathering this data (from the National Science Foundation). Let's start with the raw numbers first. The data is aggregated into 5-year bins beginning in 1965 and up to 2014. 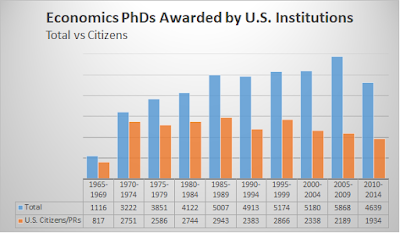 The orange bars represent the number of econ PhDs awarded to U.S. citizens and permanent residents (by U.S. institutions) over a given 5-year period. 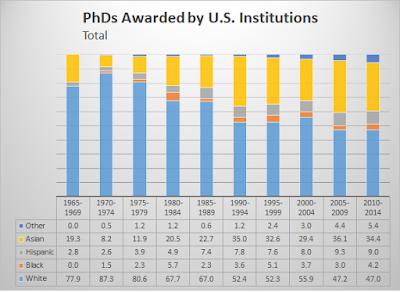 The blue bars represent the total number of doctorates awarded. 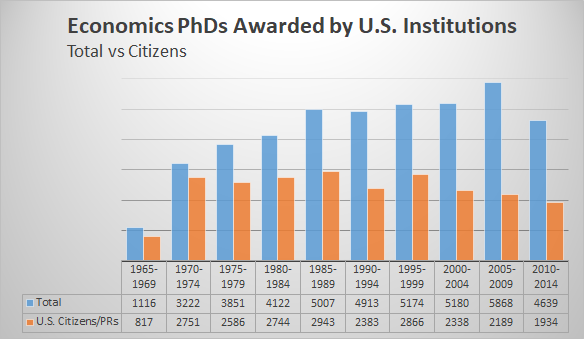 Seems like the number of econ PhDs awarded to U.S. citizens is on the decline and that this decline has been partially made up by the number of PhDs awarded to foreign students. Now, let's stick with citizens for the moment and decompose the data across various "racial" categories. The following figure reports the share of econ doctorates earned by various groups. 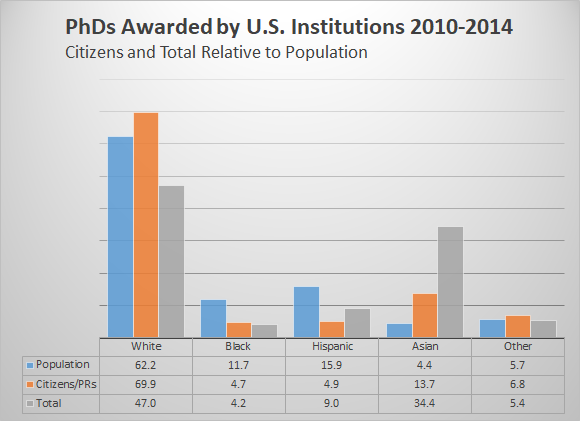 The most dramatic pattern is the relative decline of PhDs awarded to Whites and the increasing share of degrees awarded to Asians (there is also a noticeable uptick in the "Other" category which includes groups like Native Americans). Blacks and Hispanics have made some gains since the early years, but have since stabilized to about a 5% share. 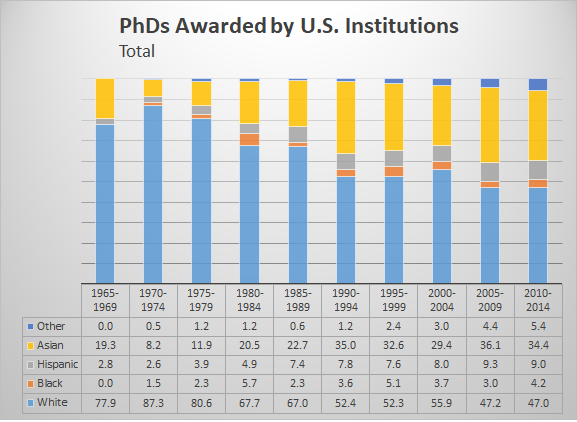 I now reproduce the picture above, but this time looking at total PhDs awarded. The relative decline of Whites here is even more evident, as is the increasing share of Asians. It is interesting to note that while the share of Hispanics has increased noticeably by including foreign (non PR) recipients, the same is not true for Blacks. One possibility here is that English-speaking foreign black students may be more likely to target the U.K. over the U.S. and that French-speaking blacks may be more likely to target French-speaking institutions in France or former French colonies, like Quebec. (It would be interesting to examine these statistics for Canadian universities). Finally, let's take a look at how the share of PhDs across groups lines up with their share of the total population. Here is what the data looks like for the period 2010-2014. While White citizens are over-represented, Whites as a whole are under-represented (relative to the domestic U.S. population). Blacks are significantly under-represented both as citizens and including foreigners. Asians, on the other hand, are significantly over-represented--both as citizens and especially if one includes foreigners. Only the "Other" category seems to be roughly representative of the population. To conclude, there are some clear racial imbalances here. 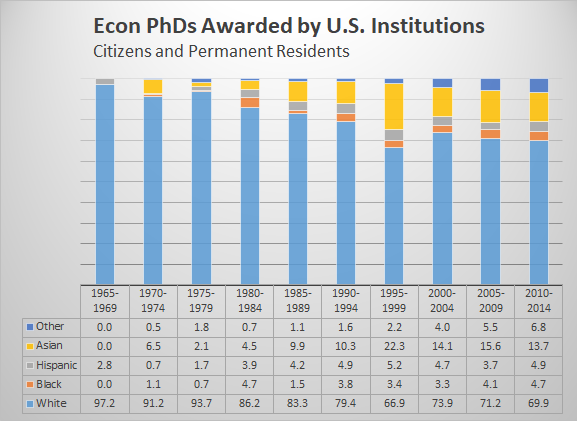 I think most people would agree that increasing Black and Hispanic representation in the U.S. economics profession is a good idea (for many of the reasons highlighted in Eshe's column). Future research into this matter should be informed by the fact that not all minority groups have fared in the same way. It would also be interesting to see how these patterns have evolved in other countries. It's well-known that the Fed has been undershooting its inflation 2% target every year since 2012 (ironically, the year it formally adopted a 2% inflation target). This has led some to speculate whether 2% is being viewed more as a ceiling, rather than a target, as it is with the ECB. The Fed, however, continues to insist that not only is 2% a target, it is a symmetric target. But what does this mean, exactly? And how can we judge whether the Fed has a symmetric inflation target or not? BA: You're about to undershoot your inflation target for the seventh straight year and you forecast that you're going to undershoot it for the eighth straight year...Can you help us to understand why people would be advocating restrictive monetary policy at a time of persistent inflation undershoots? JP: Well, we as a committee do not desire inflation undershoots and you're right -- inflation has continued to surprise to the downside -- not by a lot though -- I think we're very close to 2% and, you know, we do believe it's a symmetric goal for us -- symmetric around 2% -- and that's how we're going to look at it. We're not trying to be under 2% -- we're trying to be symmetrically around 2% -- and, you know, I've never said that I feel like we've achieved that goal yet. The only way to achieve inflation symmetrically around 2% is to have inflation symmetrically around 2% -- and we've been close to that but we haven't gotten there yet and we haven't declared victory on that yet. So, that remains to be accomplished. JS: Just following up on Binya's question...I guess if you haven't achieved 2% and you don't see an overshoot -- which would sort of be implied by a symmetrical target -- what's the point of raising rates at all? Powell replied to this by making reference to the strength of the economy -- growth well above trend, unemployment falling, inflation moving up to 2%, and a positive forecast. In this context, the rate hike seemed appropriate. Again, a sensible sounding answer -- but did it answer the question actually posed? As I reflected on this exchange, I felt something amiss. And then it occurred to me that people might be mixing up the notion of a symmetric inflation target with a price-level target. In her question above, Jeanna suggested that if the Fed has a symmetrical inflation, then we should be expecting an overshoot of inflation. But the intentional overshooting of inflation is not inflation targeting -- it is price-level targeting. With an inflation target, one should be expecting inflation to return to the target--not beyond the target. This would have been a fine answer to Jeanna's question, but isn't it inconsistent with the earlier reply to Binyamin? In that response, Powell left us with the impression that the FOMC has failed to achieve its symmetric inflation goal -- that success along this dimension would consist of actually observing inflation vary symmetrically around 2%. I'm not sure this is entirely correct. 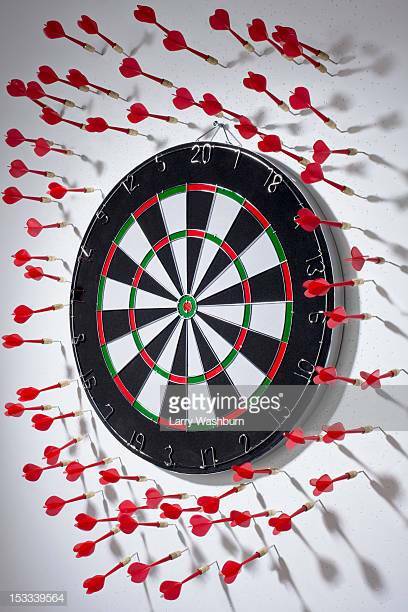 To my way of thinking, an inflation target means getting people to expect that inflation will eventually return to target (from below, if inflation is presently undershooting, and from above, if inflation is presently overshooting). A symmetric inflation target simply means that the rate at which inflation is expected to return to target is the same whether inflation is presently above or below target. To put it another way, symmetry implies that the FOMC should feel equally bad about inflation being 50bp above or below target. Along the same line, persistent inflation overshoots and overshoots should be equally tolerated (given appropriate conditions). Should a successful symmetric inflation targeting regime generate inflation rates that average around target? It's hard to see how it would not in the long run and if the shocks hitting the economy are themselves symmetric (this is not so obviously a given, but let me set it aside for now). Does missing the inflation target from below for roughly a decade imply that the FOMC has failed to implement a symmetric inflation targeting regime? Powell's mea culpa above suggests yes. But again, I am not so sure. As I said above, the success of an inflation targeting regime should be measured by how well inflation expectations are anchored around target. By this measure, the FOMC has managed, in my mind, a reasonable level of success (2015-16 looks weak). The following diagram plots the PCE inflation rate (blue) against expected inflation (TIPS breakevens) five years (red) and ten years (green) out. It seems clear enough that the real goal here is to keep longer-term inflation expectations anchored at 2%. The idea is that if inflation expectations are anchored in this manner, then the actual inflation rate today shouldn't matter that much for longer-term plans (like investment decisions). If inflation turns out to be low, you should be expecting it to rise. If it turns out to be high, you should be expecting it to fall. Nowhere does the statement suggest we should be expecting under or over shooting -- a characteristic we would associate with a price-level target. As for the phenomenon of persistent under or over shoots, the statement makes clear that the Committee would be equally (symmetrically) concerned in either case. If one accepts my definition of symmetric inflation target then, unfortunately, we do not yet have enough data to judge whether the Fed's inflation target is symmetric. The policy was only formally implemented in 2012. Since then we've only observed a persistent undershoot and the conditions leading to these persistent downward surprises. Would the FOMC be equally tolerant of letting inflation surprise to the upside for several years should economic conditions warrant? It seems that we'll have to wait and see. I had an interested chat with a colleague of mine the other day about the labor market. In the course of conversation, he mentioned that he used to teach a class in labor economics. Naturally, an important lesson included the theory of labor supply. Pretty much the first question asked is how the supply of labor can be expected to change in response to a change in the return to labor (the real wage). My colleague said that for years he would preface the theoretical discussion with a poll. He would turn to the class and ask them to imagine themselves employed at some job. Then imagine having your wage doubled for a short period of time. 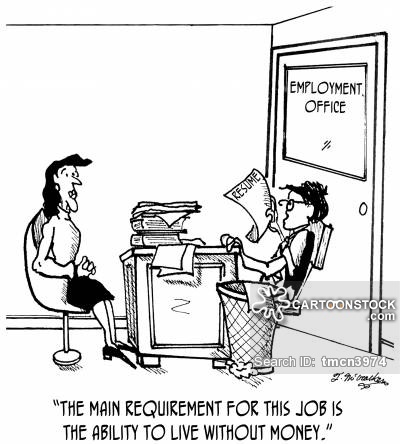 How many of you would work more? (The majority of the class would raise their hands.) How many of you would not change your hours worked? (A minority of hands). How many of you would work less? (A sprinkling of hands). At the end of the polling, he'd start teaching a standard theory of labor supply and using it to interpret the poll results (substitution vs. wealth effects). Then, one day, for no apparent reason, he decided to mix it up a little bit. Instead of asking the class to imagine an increase in the wage rate, he asked his students to consider a decrease in their wage rate. He was expecting a symmetrically opposite response. To his shock, a majority of the class responded that they would work more. Only a minority replied that they would work less or not change their hours. Surely, this was an anomaly? But when he repeated the experiment with another class, he got the same result. He mentioned it to a colleague of his, who then ran the same experiment with his class and he too confirmed the result. What was going on here? If true, then employers can apparently get more labor out their workers by lowering their wages?! The phenomenon here seems related to the evidence of "income targeting" among some groups of workers; see, for example, the classic study of New York taxi drivers by Camerer, Babock, Lowenstein and Thaler (QJE May, 1997). Evidently, inexperienced taxi drivers tend to work less when the return to working is high, and work more when the return to working is low. This behavior doesn't quite square with the phenomenon reported by my colleague. The effect there appeared to be asymmetric: students reported willing working more at a lower wage, but also reported willing working more at a higher wage. In both cases, however, it seems that the existence of some fixed obligation (e.g., monthly food and rent payments) plus no ready access to credit could explain why workers might be willing to work longer hours when the return to work declines. I'm not sure if these findings shed any light on the state of the labor market today. But it is interesting to speculate. Conventional supply/demand analysis isn't always the best guide. Does the Floor System Discourage Bank Lending? 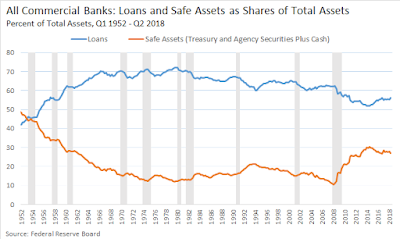 David Beckworth has a new post up suggesting that the Fed's floor system has discouraged bank lending by making interest-bearing reserves a relatively more attractive investment; see here. I've been hearing this story a lot lately, but I can't say it makes a whole lot of sense to me. Here's how I think about it. Consider the pre-2008 "corridor" system where the Fed targeted the federal funds rate. The effective federal funds rate (FFR) traded between the upper and lower bounds of the corridor--the upper bound given by the discount rate and the lower bound given by the zero interest-on-reserves (IOR) rate. The Fed achieved its target FFR by managing the supply of reserves through open-market operations involving short-term treasury debt. Consider a given target interest rate equal to (say) 4%. Since the Fed is financing its asset holdings (USTs yielding 4%) with 0% reserves, it is making a profit on the spread, which it remits to the treasury. Another way of looking at this is that the treasury has saved a 4% interest expense on that part of its debt purchased by the Fed (the treasury would have had to find some additional funds to pay for that interest expense had it not been purchased by the Fed). Now, suppose that the Fed wants to achieve its target interest rate by paying 4% on reserves. The supply of reserves need not change. The yield on USTs need not change. Bank lending need not change. The only thing that changes is that the Fed now incurs an interest expense of 4% on reserves. The Fed's profit in this case go to zero and the remittances to the treasury are reduced accordingly. From the treasury's perspective, it may as well have sold the treasuries bought by the Fed to the private sector instead. 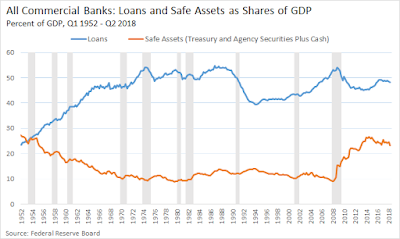 But the question here is why one would think that moving from a corridor system to a floor system with interest-bearing reserves inherently discourages bank lending. It is true that bank lending is discouraged by raising the IOR rate. But is it not discouraged in exactly the same way by an equivalent increase in the FFR? If I am reading the critics correctly (and I may not be), the complaint seems to be more with where the policy rate is set, as opposed to anything inherent in the operating system. If the complaint is that the IOR has been set too high, I'm willing to agree. But I would have had the same complaint had the FFR been set too high under the old corridor system. Alright, now let's take a look at some of the data presented by David. Here, I replicate his Panel A depicting the evolution of the composition of bank assets. It's no surprise that bank lending contracted during and shortly after the crisis. One could even make the argument that paying positive IOR contributed to the contraction. But as I mentioned above, one could have made the same argument had the FFR been kept at 25bp. Again, this criticism has less to do with the operating system than it does with where the policy rate was set. 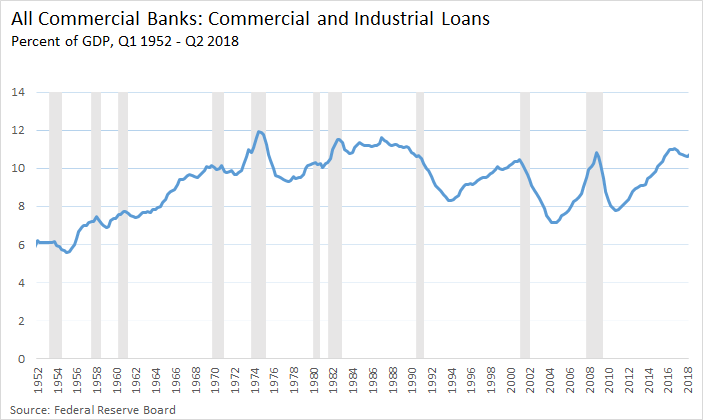 In any case, note that commercial and industrial loans are presently above their pre-crisis levels (as a ratio of GDP). To sum up, I do not believe that a floor system inherently discourages bank lending as some critics appear to be arguing. Now that the Fed is paying IOR, reserves are essentially viewed by banks as an alternative form of interest-bearing government debt. 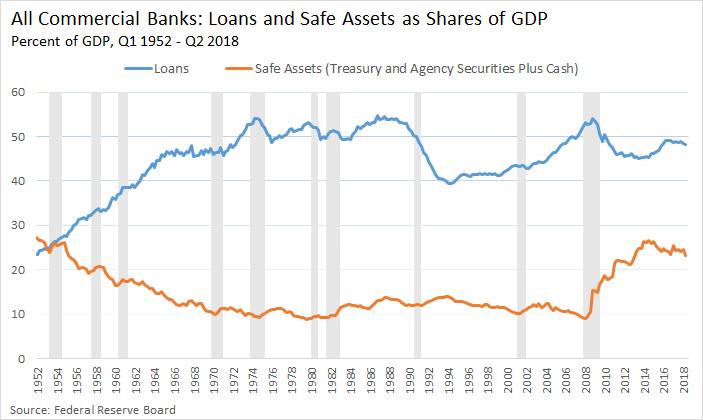 New regulations since the crisis have induced banks to load up on safe government assets. But as the following figure shows, this has not come at the expense of private lending. 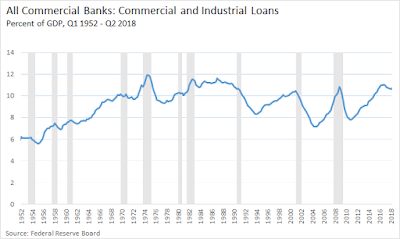 Banks are lending about as much as they have over the past 50 years (relative to GDP). 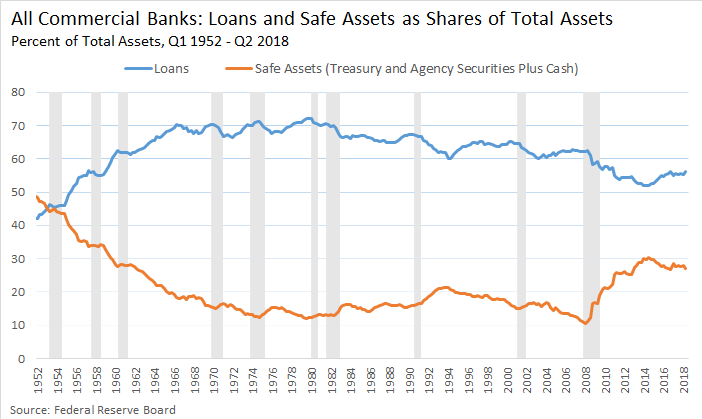 Bank lending as a ratio of bank assets may be low, but this is because banks are loaded up on safe assets--not because they've cut back on their lending activity. It's well-known that in the United States, recessions are often preceded by an inversion of the yield curve. Is there any economic rationale for why this should be the case? Most yield curve analysis makes reference to nominal interest rates. 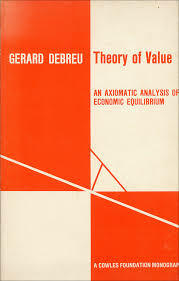 Economic theory, however, stresses the relevance of real (inflation-adjusted) interest rates. (The distinction does not matter much for the U.S in recent decades, as inflation has remained low and stable). According to standard asset-pricing theory (which, unfortunately for present purposes, abstracts from liquidity premia), the real interest rate measures the rate at which consumption (a broad measure of material living standards) is expected to grow over a given horizon. A high 1-year yield signals that growth is expected to be high over a one-year horizon. A high 10-year yield signals that annual growth is expected, on average, to be high over a ten-year horizon. If the difference in the 10-year and 1-year yield is positive, then growth is expected to accelerate. If the difference is negative--i.e., if the real yield curve inverts--then growth is expected to decelerate. What is the economic intuition for these claims? One way to think about this is in terms of Friedman’s Permanent Income Hypothesis, which states that an individual’s desired consumption expenditure today should depend not only on current income, but the likely path of his/her income over the foreseeable future. The logic of this argument follows from the assumption that people are willing and able to smooth their consumption over time, given their expectations over how their incomes are likely to evolve over time. For example, if people expect their income to be higher in the future, then they will want to consume more today in order to smooth out their consumption. They can attempt to do so by saving less (or borrowing more). If a community is collectively “bullish” in this sense, desired consumer spending should rise in the aggregate, and desired saving should fall, leading to upward pressure on the real interest rate. Alternatively, suppose that firms suddenly turn bullish on the likely returns to capital spending. Then the resulting increase in the demand for investment financing should drive real interest rates upward. In this case as well, a higher real interest rate signals the expectation of a higher rate of economic growth. If individual expectations over future prospects are correct more often they are incorrect, then higher real interest rates today should be correlated with higher future growth rates. So, in theory at least, an inverted yield curve does not forecast recessions--it forecasts growth slowdowns. Nevertheless, there is a sense in which an inverted (or even flat) yield curve can, in some circumstances, suggest that recession is more likely. Here's the basic idea. Consider an economy that grows over time, but where growth occurs unevenly (i.e., the economy alternates between high- and low-growth regimes). Imagine, as well, that the economy is occasionally buffeted by negative “shocks”—adverse events that occur at unpredictable moments in time (an oil price spike, a stock market collapse, etc.). It seems clear enough that in such an economy, recessions are more likely to occur when a shock of a given size occurs in a low-growth state as opposed to a high-growth state. Now, as explained above, suppose that an inverted yield curve forecasts a deceleration in growth. 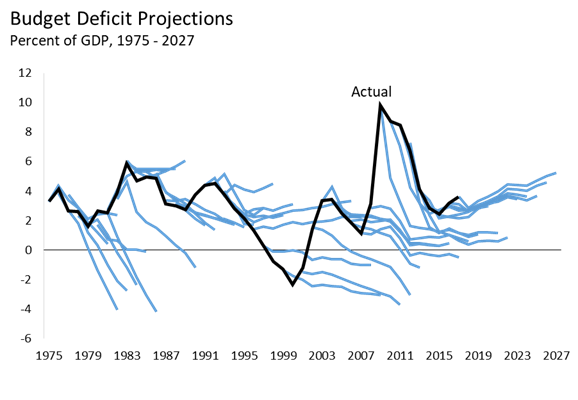 Then the deceleration will entail moving from a higher growth state to lower growth state. Suppose this lower growth state is near zero. In this state, growth is now more likely to turn negative in the event of a shock. In this way, an inverted yield curve does not forecast recession; instead, it forecasts the economic conditions that make recession more likely. How does this idea match up the data? 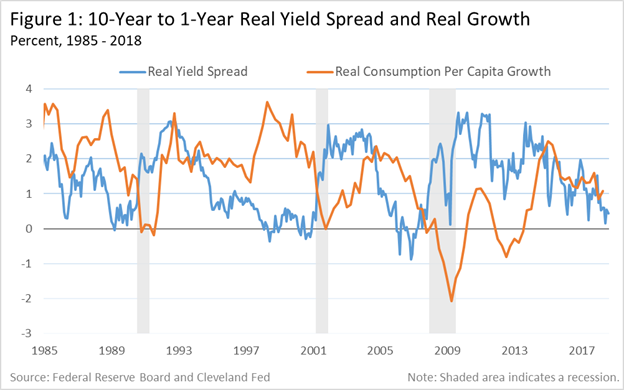 Here is a plot of the 10-1 real yield spread in the United States from 1985-2018 (blue line) along with the year-over-year growth rate of real per capita consumption--nondurables plus services (orange line). Well, it's not perfect, but as is clear from the figure, the real yield curve flattened and inverted prior to each of the past three recessions. Consistent with the theory, note that consumption growth tends to decelerate as the yield curve flattens. This is true even in non-recessionary episodes. In particular, the consumption growth deceleration of 1985-85, 1988-89, and 2006-07 were each associated or preceded by a flattening or inverted yield curve. Each of the three recessions occurred when consumption was growing at a moderate to low pace. Were the recessions that occurred following yield curve inversion forecastable? The proximate cause of the 1990 recession was the Iraqi invasion of Kuwait and the associated spike in world oil prices. Is it plausible to believe that bond market participants knew well in advance Saddam Hussein’s plans of invasion? The proximate cause of the two most recent recessions were asset price collapses (some blame Fed tightening, but theoretically gradual tightening should only cause a slowdown in growth, not a sharp collapse). While many people may have had a sense of impending doom, it seems unlikely that anyone knew years in advance the exact date of collapse. According to the interpretation here, the severity of the Great Recession was in part due to the fact that the economy was already growing slowly at the time of the collapse in real estate prices. While consumption growth did slow prior to the collapse of the “dot com” asset price bubble in 2000, it grew at a moderate rate entering that recession. Accordingly, the recession of 2000-2001 is one of the mildest ever recorded. Does the recent flattening of the yield curve portend recession? Not necessarily. The flattening of the real yield curve may simply reflect the fact that real consumption growth is not expected to accelerate or decelerate from the present growth rate of about 1% per annum. On the other hand, a 1% growth rate is substantially lower than the historical average of 2% in the United States. Because of this, the risk that a negative shock (of comparable magnitude to past shocks) sends the economy into technical recession is increased. While the exact date at which the shock arrives is itself is unpredictable, the likelihood of recession is higher relative to a high real interest rate, high growth economy. I came across a Bitcoin explainer the other day called The Trust Machine: The Story of Bitcoin. I thought it was very thoughtful presentation and I encourage anyone who's interested in Bitcoin to view it (less than 25 minutes). What I offer below are questions and comments that came to my mind as I listened to the narrative. I'd recommend listening to the entire presentation first and then reading my comments below. The bold numbers represent the corresponding time in the video to which the remark pertains. 1:04 Before Bitcoin, the only way to make electronic payments over the Internet was via your bank. However, over 2 billion people in the world do not have access to a bank account. Sure, but why is Bitcoin the best solution for this problem? Nobody was connected to their bank accounts electronically prior to the Internet. The solution was to get people connected. Most people are now connected. Why is the solution not to remove the barriers that prevent the rest from getting connected? 1:35 And even those who do have a bank account aren't exactly free to send money to anyone anywhere online (Fidel Castro graphic). If two governments don't get along, money simply doesn't flow across their borders. Digital cash would connect people economically in a way never before possible. First, just to be clear, electronic money does not "flow" across borders. Electronic money lives in a ledger. The question is who gets to use the ledger. Not being able to "send money" from the U.S. to Cuba means that Cubans (living in Cuba) are not permitted access to the ledgers created by U.S. banks and Americans are not permitted access to the ledgers created by Cuban banks. There is a communication barrier. Second, given such a communication barrier, it's hard to see how digital cash would help connect people economically--by which I mean that if money is "flowing" in one direction, goods are flowing in the other. How does digital money help lift a trade embargo? It does not. Digital money could be used, however, to facilitate international remittances. 1.59 Antonopolous remarks that Bitcoin can do for banking and finance what cellphone technology did for communications and empower billions of people around the world. Brito remarks that Bitcoin for the first time makes possible P2P transactions without the aid of intermediary. I have a lot of respect for both these guys. But I'm still not sure how Bitcoin (or blockchain technology more generally) is supposed to facilitate banking and finance (I elaborate here). As for the contention that Bitcoin does not need a third party to clear transactions, this is, strictly speaking, not true. The third party in Bitcoin consists of the miners--no P2P transaction can be cleared without their help. 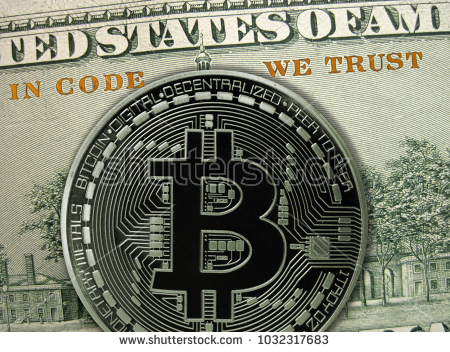 So, no, Bitcoin is not "just like cash" (which truly does not depend on any 3rd party). 5.16 Within a small trusted group like a family, you really don't need money. Money actually starts as a shared memory. I'm really happy to see this key insight--known to anthropologists and economists for a long time--is starting to catch on. See: Why the blockchain should be familiar to you. 5.40 But this kind of written money works only if we trust the people we are making promises with. 11.50 This leads us back to the problem we face online. The Internet connects people globally, yet people are largely restricted to using local currencies. Who is going to make the digital "tickets" for the Internet? And who will we trust to be in charge of them? 12.22 The key to Bitcoin is the way Satoshi flips the traditional model of trust on its head. Instead of letting a bank control the ledger, you share it with everyone. This is subtly (and importantly) misleading. Control of a ledger does not map simply into whether it is shared or not. For any ledger, read and write privileges need to be separately specified. It is true that in today's banking system, banks possess both read and write privileges and that they limit the read privilege severely (you can only look at the account balances in your account and no one else's). Note that there is no technological reason for why conventional bank ledgers cannot be made open for public viewing. Doing so would effectively make the ledger "shared" and "distributed" (if it could be freely copied). That this does not happen reflects the preferences of bank customers. We don't want the world having full viewing privileges over our personal bank accounts. But there is nothing right now with current technology that prevents people from publishing their diary online (rendering is shared and distributed). 12.45 This shared file model is more secure than any bank ledger could ever hope to be. If every student in a classroom can see what the school teacher scribbles on the blackboard, then it'll be very hard for the teacher to later claim she did not write it. Say something stupid in public and you'll never erase the public record. This is the power of a shared ledger. But banks already have the power to share their ledgers. Their bank customers do not want them to. Perhaps bank customers wouldn't mind so much if their accounts were anonymous (like the old Swiss bank accounts). I'm sure that Paypal would love to offer Swiss-style bank accounts. If it was legal. Which it is not. But if this is what people truly want, then why not have them lobby their respective governments to reinstate the anonymous bank account? Bitcoin is a "solution" in this regard only insofar it circumvents the law (which it's very good at doing, since it's a decentralized autonomous organization). 12.50 Bitcoin is a piece of shared software that everyone runs together instead of having one trusted computer do it (Graphic shows bank with one copy of ledger and Bitcoin with multiple copies). First, there is nothing that prevents a bank from keeping multiple backup copies of its ledger (Fedwire has multiple back up computers, for example). Second, I'm not sure what it means for "everyone to run a shared software together." I presume it means that the agents or agencies that have volunteered to operate as miners collectively agree to follow the protocols laid out in a particular version of the software. Sure, and banks within the banking system collectively agree to abide by banking regulations. The software evolves over time in accordance with the wishes of the broader community--miners can "vote" on which version of the software to use--code patches that benefit the community are adopted. Banking regulations also evolve over time in accordance with the wishes of the broader community via choices made by elected representatives. 13.57 There is no center to the network, no central authority, no concentration of power. It's exactly how ant and bee colonies function. To say that there's absolutely no concentration of power is overstating things. The core developers likely have more say than others. Those agencies that have invested heavily in mining equipment have more say than others. Concentration of mining power is a concern. (Miners themselves have avoided overly concentrating power for fear of destroying the franchise value. This is, ironically, the same force we expect to discipline conventional banks.) And as for ant and bee colonies, they have hierarchical structures, including a queen. From outer space, humanity looks like an ant colony. So yes, Bitcoin functions just like an ant colony--governed by protocols--as does everything else. This is done very nicely. There is something beautiful about the blockchain, to be sure. And while I have some quibbles with what is said in this section, let me step back and comment on the broader picture. The key innovation of blockchain is in terms of how the write privilege is governed (in particular, the read privilege is not the innovative part; see my discussion above). The conventional solution to the scaling problem is to delegate the write privilege to a reputable agency (which itself is governed by the laws of society). Judging by the way world commerce has expanded over the centuries, the conventional model has been a huge success. Of course, the conventional model is not perfect. It has been and continues to be a work in progress. Why not concentrate our efforts on continuing to improve this conventional and successful model? As far as I can tell, this is what corporate "blockchain" solutions are offering (as part of the broader effort to improve information management systems more generally). They are not offering (again, as far as I can tell) bona fide "blockchain" solutions--they are offering "blockchain inspired" innovations in data management (for example, increased transparency and more extensive sharing of the ledger). The spirit of Bitcoin is based on the more ancient model of collective recording-keeping via a communal consensus protocol. That this is now possible on a global scale is the work of genius (much the same way double-entry book-keeping was a stroke of genius). But extending the write privilege communally comes at a cost. This is because individuals will always find it in their interest to rewrite history in a manner that benefits themselves at the expense of the broader community. How to guard against this? People somehow have to earn the right to write history, so to speak. The Bitcoin consensus protocol uses a Sybil control mechanism called Proof-of-Work (PoW) that dictates who earns the right to "vote" (i.e., who gets to add a given paragraph of script to an ever-growing novel). Essentially, the write-privilege in consensus protocols have to be gamed. The question is whether the game in question generates good outcomes (where "good" is to be judged by network members). Bitcoin has shown us that consensus-based record-keeping on a large scale is feasible. But it is also terribly inefficient along many dimensions (note: I say this as a matter of fact, not as a matter of passing judgment since conventional banking systems are also terribly inefficient along many dimensions). There is the hope, however, that advances in the design of consensus algorithms will render consensus-based record-keeping more efficient. But the same hope exists for database management systems more generally. And so, in true Darwinian fashion, we are witnessing a struggle between competing species. Will there be a clear winner in the end? Or, as is more likely in my view, will there be a peaceful (but still competitive and ever-evolving) coexistence? Related Reading: Blockchain: What it is, What it does, and Why you probably don't need one. My other musings on the subject available here in case you're interested. In my previous post (Inflation and Unemployment), I reviewed what I thought was a fair characterization of the way the Federal Reserve Board staff organize their thinking about inflation and unemployment, as well as how this view of the world was at least partly responsible for the "hawkish" overtone of current Fed policy. I also suggested that the inflation and unemployment dynamic might be better understood through the lens of an alternative theory that emphasized the supply and demand for money (broadly defined to include U.S. treasury debt). I want to thank Paul Krugman for taking the time to critique my post and draw attention to an important issue that concerns U.S. monetary policy makers today (see: Immaculate Inflation Strikes Again). I was only a little disappointed to learn that I agreed with almost all of what he wrote in his column. But if this is the case, then what are we debating? And more importantly, how does it matter, if at all, for monetary policy? The amount of disagreement in macroeconomics is often exaggerated and I think this has definitely been the case here. While we may disagree on some things, we seem to agree on the most important part, namely, on the present conduct of U.S. monetary policy. Krugman begins his piece by stating three questions. Let me state the questions, followed by my own answers and comparisons. 1. Does the Fed know how low the unemployment rate can go? I have quipped before that this is one case in which the Fed can definitely count on a zero-lower-bound being in effect (and this is not just in theory, Switzerland had virtually zero unemployment throughout the 1960s, with low inflation I might add). But what this question is really asking is how low can the "natural" rate of unemployment go? I agree with Krugman: we don't know. But I'll further add: we don't even know if a "natural" rate of unemployment exists in the first place. It's just a theory, after all (which is not to say it shouldn't be taken seriously, only that we need to keep that important caveat in mind). 3. Is there any relationship between inflation and unemployment? I think it would be odd for any macroeconomist schooled in general equilibrium to suggest that the answer to this question is unequivocally no. The answer is yes. The real question is what type of relationship? In labor market search theories of unemployment, where firms and workers bargain over a joint surplus, a low unemployment rate can result in a higher real wage because workers have greater bargaining power. If a decrease in the unemployment rate leads to a rise in the real wage, it could, ceteris paribus, have an effect on the price-level (and, if prices are temporarily sticky, the adjustment could come along other margins). But an increase in the price-level is not the same thing as an increase in the inflation rate (though short-run price-adjustment costs can transform a price-level effect as a short-term rise in measured inflation). For workers to afford buying goods in the presence of ever-rising prices, their bank accounts are going to have to grow accordingly. Ultimately, this can only happen in aggregate if the aggregate quantity of money is growing, either through the banking sector or through the increase in the supply of outside money (including treasury debt). This is the sense in which I think inflation has to be a monetary phenomenon and that, moreover, the actual rate of inflation is ultimately not governed by whether unemployment is living above or below its "natural" rate, whatever that is. Does the debate over question 3 matter? Yes, it could, because different interpretations of how the world works usually--though not always---implies something different about optimal policy. The Phillips curve theory of inflation suffers from a free parameter problem: the natural rate is unobservable and hence, one can always appeal to a shift in the natural rate to explain away discrepancies with the data. However, the monetary theory I prefer also suffers from a free parameter problem: money demand is not directly observable either. I can always appeal to some unobserved shift in money demand to explain away discrepancies with the data. For this reason, it would be useful for economists to identify "robust" policies--policies that can be expected to deliver good results regardless of which theory best describes the world we are living in. Is the Phillips curve view of inflation contributing to a policy mistake? I wanted to suggest in my post that it is, although this is not necessarily a fault of the theory as much as how it is applied. That is, there may be no policy mistake in the making if the FOMC simply lets its estimate of the natural rate fall freely as evidence of impending inflation fails to materialize. However, this is not what is happening. As Jim Bullard explained to me, he believes that Phillips curve proponents have a (strictly positive) lower bound on their estimate of the natural rate. The unemployment rate is so low now -- how can it possibly go any lower -- this has to lead to inflation in the near future -- it just has to. We'd better start raising now, before we find ourselves behind the curve. Here is where the "monetarist" view could temper such resolve. Granted, the global outlook is looking relatively rosy, and fiscal policy seems expansionary--these are both inflation risks from a monetarist perspective. On the other hand, there is considerable uncertainty in this outlook, not the least of which is presently being fueled by talk of a global trade war. 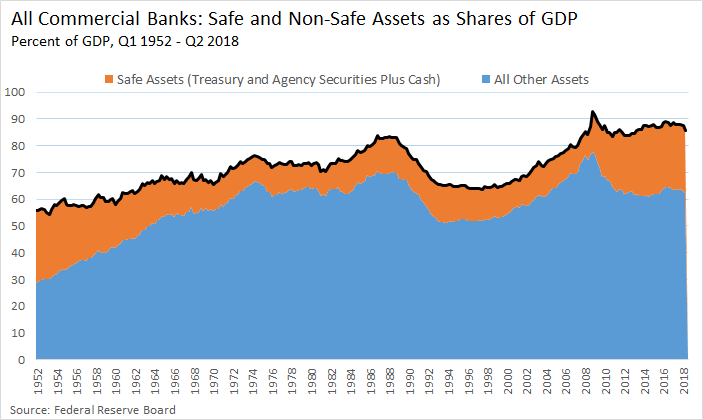 In uncertain times, consumers and investors are likely to lower their demand for goods and services--increasing their demand for safe assets, like U.S. dollars and U.S. treasuries. We can see these concerns weigh on long-bond yields. Market-based inflation expectations (like the 5yr-5yr forward) seem well-anchored. Current inflation is running below target. All of this suggests that the Fed can afford not to move aggressively at this time (to be fair, the FOMC regularly emphasizes the "data dependent" nature of its policy path). And yes, this is consistent with PC advocates that are willing to let their estimate of the NRU decline in line with the evidence. Krugman presents the following data for Spain. He writes "Consider, for example, the case of Spain. Inflation in Spain is definitely not driven by monetary factors, since Spain hasn’t even had its own money since it joined the euro. 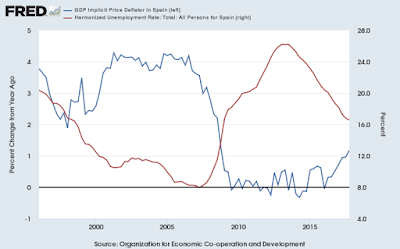 Nonetheless, there have been big moves in both Spanish inflation and Spanish unemployment:"
Krugman asserts because Spain doesn't have its own monetary policy, that monetary factors were not responsible for swings in Spanish inflation and unemployment. But my interpretation of the great crash and subsequent rise in unemployment is that it was caused by a large positive money demand shock (where again, I stress, by money I include safe government debt). This positive money demand shock (flight to safety) is just the opposite side of what Krugman and others would label a negative aggregate demand shock. So once again, I think Krugman is digging moats (perhaps unintentionally) where he could be building bridges. 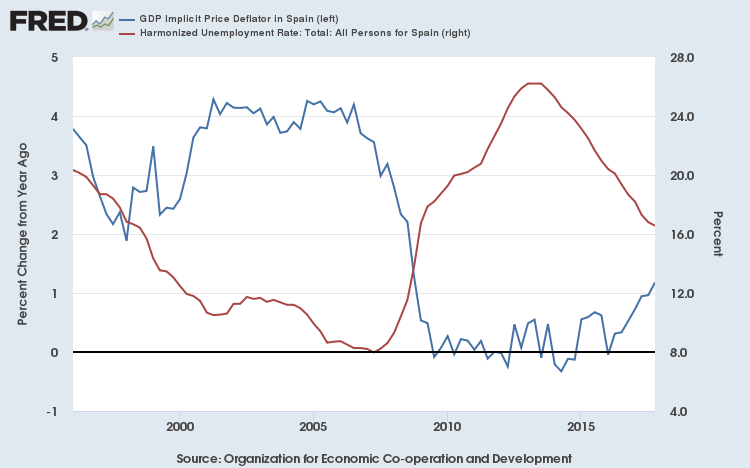 The other thing I should like to point out about the Spanish data is whether it suggests that low unemployment forecasts future inflation (which is really what my post was about). A naive reading of the data above suggests that low unemployment actually seems to forecast low inflation. Again, this suggests caution in using the unemployment rate to forecast inflation. Finally, on Krugman's broader point: "economics is about what people do, and stories about macrobehavior should always include an explanation of the micromotives that make people change what they do. This isn’t the same thing as saying that we must have “microfoundations” in the sense that everyone is maximizing; often people don’t, and a lot of sensible economics involves just accepting some limits to maximization. But incentives and motives are still key." Conventional wisdom is that a central bank can anchor the long-run rate of inflation to a target of its own choosing. This belief is evident where ever a government has charged its central bank with a "price stability" mandate (commonly interpreted nowadays as keeping a consumer price index growing on average at around 2% per annum over long periods of time). What exactly is the mechanism by which a central bank is supposed to control the long-run rate of inflation (the growth rate of the price-level)? And is it really the case that a central bank can defend its preferred inflation target without any degree of fiscal support? Asking these questions reminds me of the old joke of an economist as someone who sees something work in practice and then asks whether it might also work in theory. In the present context one might point to the success that central banks have experienced with inflation-targeting. It works! And remember how the Fed under Paul Volcker (Chair from 1979-87) slew the 1970s inflation dragon with its Draconian anti-inflation policy? What else do we need to know? Well, how did Volcker do it exactly? The conventional view is that Volcker tightened monetary policy sharply by contracting the rate of growth of the monetary base (which paid zero interest at the time). The unexpected shortfall in bank reserves led to a sharp increase in short-term interest rates and a severe recession (1981.2-1982.4). As is typically the case in a recession, the rate of inflation fell, a phenomenon commonly attributed to the decline in aggregate demand for goods and services as unemployment rises and as incomes fall. But what kept the inflation low after the recession ended? Why did the inflation rate continue to decline as the economy grew (and as the unemployment rate fell)? It's hard to argue that inflation expectations were declining. 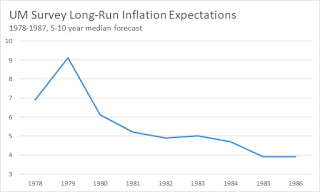 While inflation expectations fell with inflation from 1980-82, the median one-year-ahead inflation forecast from the University of Michigan survey remained flat at around 3% for the rest of Volcker's tenure. Although we have no direct market measure of long-term inflation expectations for that period, the 10-year treasury yield is probably not a bad proxy. And while the 10-year yield does decline in the 1981-82 recession, it remains elevated relative to historical (low inflation) norms and begins to rise in 1983 from just over 10% to 13.5% in 1984. One could argue, I suppose, that the Volcker Fed kept inflation in check by raising its policy rate aggressively against signs of rising inflation expectations (the Fed had by this time abandoned targeting monetary aggregates). Thus, despite a growing economy, the Fed's interest rate policy kept realized inflation in check, even as expected inflation remained elevated. Then, in the second half of 1984, long-term yields (long-term inflation expectations) began to decline. Shortly after, the Fed's policy rate declined as well. Inflation continued to decline modestly. All the while, the economy continued to grow (the unemployment rate continued to decline). Why did inflation remain low and why did inflation expectations decline? One could argue, I suppose, that the aggressive action taken by the Fed in the first half of 1984 (not to mention the even more aggressive actions taken earlier in Volcker's tenure) finally convinced markets that the Fed was committed to keeping inflation low. This had the effect of keeping short-term inflation expectations low, which motivated wage and price setters to factor in lower cost increases. And it had the effect of lowering long-term inflation expectations, driving long-bond yields lower (as bondholders require less compensation against the loss of purchasing power of money due far in the future). 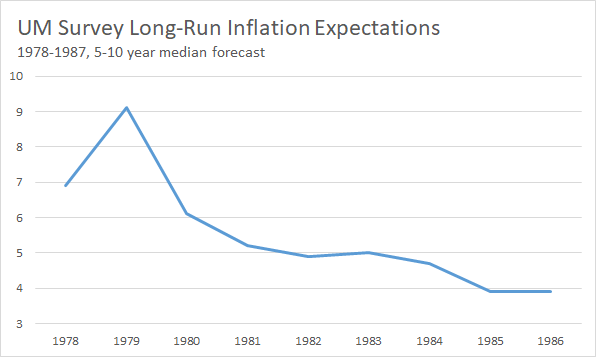 The decline in longer-term inflation expectations c. 1984-85 also evident in the median 5-10 year forecast of inflation from the University of Michigan survey. So that's the basic story. A central bank that credibly promises to snuff out any hint of rising inflation (and inflation expectations) can keep inflation anchored at a preferred long-run target of its choosing. Ironically, the threat of raising the short-term interest rate against inflationary pressure is what keeps nominal interest rates low. Moreover, if a central bank can credibly commit to a long-run inflation target, the effect is to keep longer-term bond yields low as well. The fact that things didn't work out so smoothly for Volcker early in his regime was because the Fed lost credibility in the 1970s and this credibility took time to rebuild. I think there's a lot of merit to this view. But I still have a nagging doubt that U.S. fiscal policy had little or anything to do with Volcker's success at keeping inflation low. What exactly am I talking about--didn't Volcker accomplish his goal despite the Reagan deficits? As the diagram above shows, the year-over-year growth rate of nominal debt in April 1983 hit a peak of about 22%. The growth rate of debt turned around sharply after that, dropping to 14% in July 1984. After popping briefly to 17.5% in October of 1984, it started to decline, slowly at first, and then more sharply in 1986. The ups and downs in the picture probably do not matter as much as the underlying trends. What matters is whether people generally believe fiscal policy to be anchored in the sense of keeping the long-run rate of nominal debt growth low. (Note: another notion of "anchored" fiscal policy corresponds to keeping the debt-to-GDP ratio stable, even though stability of this ratio is consistent with any inflation rate). If the claim is that the Volcker Fed could have lowered inflation permanently without fiscal accommodation, then it could have done so with debt continuing to grow indefinitely at (say) 20% per annum. There would have been no reason to reverse the Reagan tax cuts! So, the thought experiment is this: suppose that the political pressure to reduce the Reagan deficits was absent. Could Volcker have kept inflation low? Alright, so now we have nominal debt growing at 20%. Suppose inflation does not change and suppose inflation expectations remain anchored. Then the Fed will have no reason to raise its short-term interest rate. And bondholders will have no reason to demand higher long-term yields. But lo, then there's a free lunch at hand. The government can simply use its paper to finance its expenditures without resorting to taxes. At best this might hold for a highly depressed economy, but it seems unlikely to hold for the case we are considering (robust economic growth and low average unemployment). Something has to give. But what? If inflation and interest rates don't budge, then the public is being asked to hold an ever-increasing quantity of debt at the same real (inflation-adjusted) rate of interest. Assuming that the foreign sector doesn't fully absorb it, the increasing level of debt must crowd out domestic investment at some point. The private sector will attempt, at this point, to attract funding by offering higher returns on its debt-offerings. How does the real yield on government bonds rise if the nominal interest rate and inflation remain fixed? Is the Fed supposed to increase its policy rate in the face of declining investment (crowding out)? One thing to keep in mind is that the permanent tax cuts will have made the private sector wealthier. It seems likely that at some point, they will want to spend this wealth. Of course, in aggregate, the public cannot dispose of the government bonds it holds--the bonds can only pass hand-to-hand. But this smells like a classic "hot potato" effect -- people will try to spend their wealth, driving the price-level higher (reducing the real value of the outstanding government debt). So, suppose that inflation starts to rise (along with expectations of inflation). In response, the Volcker Fed increases its policy rate sharply and restates its commitment to keeping inflation anchored. The effect of the rate increase might be to slow economic growth and keep inflation in check for a while. But remember, the fiscal authority doesn't care in this thought experiment--it just keeps printing debt as rapidly as ever. The inflationary pressure has to return. So the Volcker Fed raises its policy rate again. And again. And again. And again. This is not going to work. It is of some interest to note that Volcker himself did not appear to believe that the Fed could unilaterally keep inflation low. At least, I say this judging by the way he often criticized the Reagan administration for its loose fiscal policies. According to Volcker 1982 (see here), huge government deficits were responsible for high interest rates (the Fed's high-interest policy). In other words, fiscal policy was responsible for the price-level pressure that necessitated the Fed's high-interest rate policy. The clash between the Fed and the administration at that time makes for some interesting reading (see also here). In light of the recent shift in fiscal policy, one wonders whether a similar conflict might be in the works in the not too-distant future.